African Bull Elephant: (Loxodonta africana) 1/20 scale, five piece cast, trunk, tusks, and tail cast separate. Comes with a resin base as well as a contoured pine base for display. The model comes unpainted easy to assemble with a minimum amount of preparatory cleanup before being ready to paint. 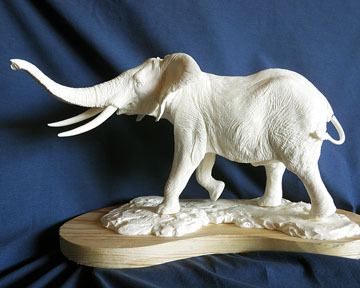 All African Elephant models are hand cast with Por-A-Kast resin at The Alchemy Works.